- They have high intensive coercive force and are practically free from self-demagnetisation. The following shapes are available. - Rings, rectangularrs, squares, Segments, Discs, Cylindricals, Plasto-ferrites, Rubber Sheets, Strips, Nd FeB magnets, etc. - Special manufactures permanent ferrite. 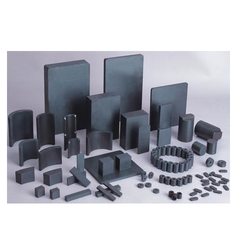 - Ferrite Magnets are available in the following shapes: Cylindrical, Block, Ring Magnets. The noted features of our alnico magnets are their excellent temperature stability and their high residual induction. The materials used for the fabrication of these magnets are aluminum, cobalt, nickel, copper, iron, etc. The primary processes employed by us for manufacturing the alnico magnets include casting and sintering.